The Treasure Of Moncrief Springs is a sample chapter from John Cowart’s book Crackers & Carpetbaggers: Moments In The History of Jacksonville, Florida available at www.bluefishbooks.info . The story of Moncrief’s escape from France laden with nine treasure chests full of jewelry and of his subsequent adventures is told in the June 25, 1874, issue of the Tri-Weekly Florida Union. That newspaper attributed the tale to “Irving’s sketch” entitled “Subterranean Religion”. Although the Irving quoted is not identified by the paper, in 1834 Washington Irving, of Sleepy Hollow fame, met Florida governor William Pope Du Val, for whom Duval County is named. Irving later wrote a book based on Du Val’s exploits as a pioneer in Florida; it was called The Early Experiences Of Ralph Ringwood. Perhaps Du Val, whose family was of French Huguenot extraction, related the tale of Moncrief’s treasure to the author of The Sketch Book. On July 14, 1789, the Bastille fell. During the bloody revolution that followed, many aristocrats panicked and fled Franc. Almost everyone who owned valuables was anxious to convert them into ready cash, even at a loss. “At this time, diamonds were relatively cheap. Designs for diamond jewelry became as delicate as those for fine Point lace and never before or since has jewelry of greater intrinsic magnificence been produced,” said Marcus Baerwald in his History Of Jewelry. Moncrief, who was not an aristocrat, was on the scene to do business. Through his pawn operation he soon accumulated vast numbers of the rose-cut and brilliant-cut diamonds which had grown popular as aristocratic ladies followed the fashions set by Queen Marie Antoinette. 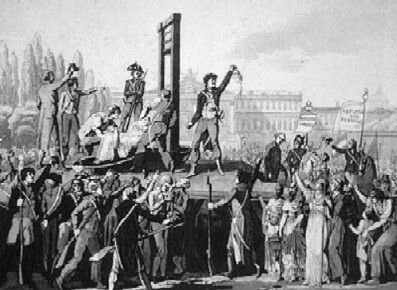 On December 31, 1789, Dr. Joseph Guillotine proposed to the French Constituent Assembly that, “On all cases of capital punishment, it shall be of the same kind – that is decapitation – and it shall be executed by means of a machine… In cases of capital punishment the privilege of execution by decapitation should no longer be confined to nobles”. As the revolution continued, nearly 40,000 common people shared with aristocrats in this unexpected fringe benefit by being beheaded by the good doctor’s machine. 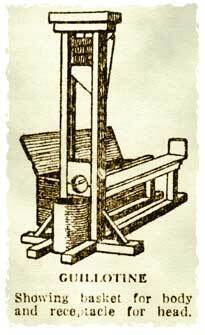 Guillotine’s death machine took the form of a heavy triangular blade that moved smoothly on two upright rails. The weighted blade was drawn to the top by a rope, the victim’s head was placed between the rails, and then the headsman simply let go of the rope. Dickens wrote, “So used are the regular inhabitants of the houses to the spectacle that in many windows there are no people to watch”. Under such conditions, Moncrief’s business flourished. Who would hold onto golden trinkets when their sale might buy passage away from the horrors? On April 6, 1793, when the Committee of Public Safety ushered in the “Reign of Terror”, things really began to get rough. In Parris 2,639 people lost their heads. On April 19th – only 13 days after the committee came into power – Eugene Moncrief boarded the galley Esperance bound for Florida. In the Vendee, the royalist-tinged region where Moncrief had lived, 8,000 people were beheaded within the next three months. But Moncrief, although a fugitive, did not leave empty-handed. “For years Moncrief had, under the seductive and absorbing sign of the pawnbroker’s three golden balls, been gathering in out of the wet such little bijoutrie as rings, breast pins, diamonds, gems and so successful had been his efforts that as Eugene was being borne away from his native shores, his tear-bedewed eyes found comfort in resting upon nine wooden chests of such material,” Irving wrote. The voyage took two months to the day. On June 19, 1793, the Esperance entered the mouth of the St. Johns River. Moncrief acquired some property and, on July 3rd, “buried his treasure within a short distance of the spring that now bears his name,” Irving said. Florida, a swampy, hommokky country, furnishes such a plenty and variety of supplies for the nourishment of animals that I venture to assert that no part of the globe so abounds with wild game, or creatures fit for the food of man. Thus they (the Indians) enjoy a super-abundance of necessaries and conveniences of life with security of person and property, the two great concerns of mankind. The hides of deer, bears, tigers and wolves, together with honey… and other productions of the country purchase their clothing, equipment and domestic utensils… They seem to be free from want or desires. No cruel enemy to dread; nothing to give them disquietude, but the gradual encroachment of white people. He describes the Indians as “all dressed and painted with singular elegance, and richly ornamented with silver plates, chains, etc… Many carried fans made of feathers of wild turkey, the beautiful pink-colored crane or the scarlet flamingo”. When the women danced, “they wore strings of tortoise-shells and pebbles around their legs, which rattled in cadence to the music”. Moncrief had found a home. He owned rich land with a free-flowing spring that would later be described as having “as pure water as ever responded to the rod of a bulrush Moses or fascinated the poetic longings of Juan Ponce de Leon”. Moncrief had his nine chests of jewels, and before long he had one of the beautiful Indian dancing girls. Her name was Sun Flower. No turkey-feather fans or tortoise-shell trinkets for this woman. Moncrief was so infatuated with her that he decided to deck her out in as much sparkling splendor as any lady in King Louis’ court. “At the expiration of six month, Eugene dug from the earth one of the boxes of buried treasure to secure suitable treasure for decking his chosen Indian bride,” Irving said. Moncrief brushed away the dirt clinging to the chest, unlocked the clasps, and threw back the lid. Diamonds glittered and flashed in the light. Sun Flower buried her hands in the box and let gem stones trickle between her fingers. She snatched up first one piece then another, holding them to her breast to see how they would look against her copper skin. Sun Flower soon decided that she liked the jewelry better than she liked the jeweler. Although Sun Flower did not have any diamonds before Moncrief opened that first chest, she did already have a lover – a warrior named Grand Powder. “Alas for poor Eugene,” Irving lamented, “Indian cupidity was excited by this grand display. When another moon waxed, Eugene’s scalp was drying in the tent of Grand Powder and Sun Flower was preparing his goadiago (an Indian dish)”. Moncrief had, after all, lost his head – or at least the top of it – despite his escape from the guillotine. But, the pawnbroker’s murderers did not escape retribution. “Grand Powder and Sun Flower were shortly afterwards visited by an angry Providence while sailing in a canoe on Trout Creek -- and today lies concealed the collection of poor Moncrief,” Irving wrote. What happened to the remaining eight chests of treasure? Two days after it ran the Irving account, on June 27, 1874, the Tri-Weekly Florida Union carried this announcement: “A Joint stock company is about to be formed for the purpose of bringing to light some of the magnificent old jewels supposed to be lying around loose somewhere near Moncrief Springs”. Through Hansontown and its narrow circuitous lanes and alleys, we emerged into the open prairies. Then passed the Little and Swain Plantation, thence up the hill and on until we struck a cowpath that meandered around stumps, fallen trees, marshes and swamps and were nearly swamped at the petty crossing as our horse got bogged down in the marsh. Jumping out and dragging and lifting our buggy from the mud and mire, we finally reached high ground and mounted the hill, with five different cowpaths and blind roads before us. Uncertain which was right, we take the middle one, thence 100 yards we leave the track and strike boldly through the woods without a path or guide. After one and a half hour’s drive, deviating in our course times innumerable to avoid fallen trees, stumps and swamps, we arrived at the picket bridge. Thence meandering up the creek, going three miles to get one, we arrived at a cowpath that led down the hill that led to the spring. A short walk and we stood by the spring… a wonderful spring. Not 20 men in Duval County have seen or heard of it”. Thomas had rediscovered Moncrief’s spring, but not his treasure. 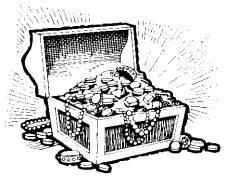 There is no record of the treasure ever being recovered, but in the late 1800s the spring was developed by Jacksonville Mayor Peter Jones into a swimming resort complete with hotel, restaurant, dance pavilion, nine-pin alley, baseball diamond and horse racing track. A toll road paved with shells led to the resort. On may 21, 1910, Charles K. Hamilton brought the first Curtis biplane to be seen in Jacksonville to an exhibit at the Moncrief Spring Park. He raced his plane against a Cadillac automobile driven by Dexter Kelly. The biplane soared to the height of 2,500 feet and reached a speed of 60 miles an hour in a dive; but the Cadillac won the five-mile race. In 1945, Eartha White of the Clara White Mission bought the 8 acres surrounding the spring for a recreation area and nursing home. The mission still owns the property, but according to Executive Director Grayce Bateman, when the state built the bridge which now carries Moncrief Road across Moncrief Creek, the spring was destroyed. No treasure was uncovered during the road’s construction. When she was a girl, Clara Leroy, whose father rented a farm on the property, uncovered the only hoard ever found in the vicinity of the spring. It was during World War II and paratroopers from Camp Blanding used the old park for practice landings. “Sometimes, there would be what looked like thousands of parachutes in the air and soldiers all over the place,” Mrs. Leroy said. Apparently the cold spring water hadn’t satisfied the thirsts of every one of those soldiers and the previous owner of the farm had supplied a supplement to them. “When Daddy told us to dig up the ground for a garden behind our garage,” Mrs. Leroy said, “We found over a dozen jugs of moonshine buried there. That’s the only kind of treasure I’ve ever heard about”.